The Castle Street side with much of the top floor removed for conservation. 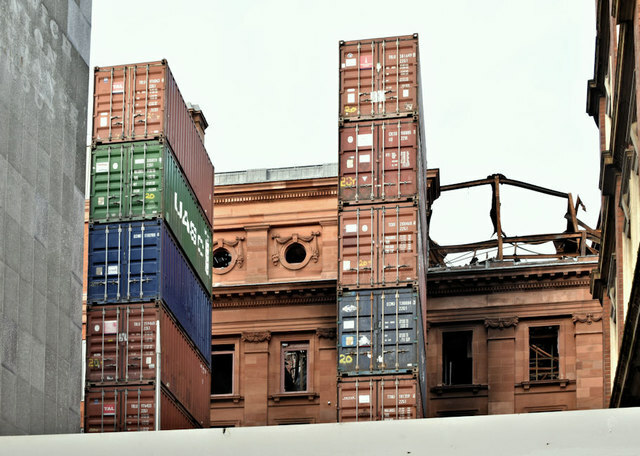 There are now two stacks of containers, acting as a safety measure, in the event of the building’s collapse. The grey band (bottom) is part of the barrier stopping access from Fountain Street. The building is the subject of the following application (5 October 2018) for planning permission “LA04/2018/2393/LBC Conservation led works to Bank Buildings involving the taking down, recording and assessment for restoration purposes of the building above the fourth floor cornice line to the Bank Street, Castle Street and Castle Place elevations of the building for off-site storage |Bank Buildings (bounded by Castle Street Bank Street and Royal Avenue) Royal Avenue Belfast BT1 1BL”. Belfast City Council’s Planning Committee has this morning approved Primark’s listed building consent application for Bank Buildings. Approval has now been given for Primark’s proposal to begin conservation-led works to take down the top two floors of Bank Buildings, which appear to be the most unstable parts of the building. Once these unstable elements are removed, works can take place to install a façade retention scheme. It will also make it possible to reduce the cordon and restore pedestrian access between Royal Avenue and Donegall Place, subject to health and safety considerations as work takes place. It is understood that Primark are now ready to commence this work. We have also agreed a process with Primark which includes a temporary designed walkway, which we hope to be in place within weeks. Councillor Matt Garrett, chairman of the Council’s Planning Committee, said: “I’m pleased that we have been able to give the green light to this application and work can now get underway with the aim of reducing the cordon as soon as possible, and as soon as it is safe to do so. “The Committee has asked for an undertaking from Primark that it will begin work as soon as practically possible. There is a real urgency for businesses, both inside and outside the cordon, to ensure their economic resilience in the run-up to Christmas and beyond, so it’s vital that Primark moves forward and ensures the required works are completed as soon as possible” - official statement. “A temporary walkway reconnecting Royal Avenue to Donegall Place will open on Monday 3 December. Three businesses around the Castle Place junction - McDonald’s, Skechers, Argento will reopen on Monday and Spar will also reopen on Tuesday with reduced hours. Argento is still open in Cornmarket. Zara, Tesco Metro and British Heart Fountain remain closed while works continue to secure Bank Buildings, and City Picnic (extra market stalls in Donegall Place) and Abacus Beads (Queen's Arcade) will continue to trade from their temporary premises. A new Primark store will open at Commonwealth House, on Castle Street, next Saturday 8 December. Look out for new signage and maps across the city centre from next week, showing which businesses have reopened and highlighting those near the remaining cordon areas. This information is correct as of Friday 30 November, 5.30pm” - Council statement. The idea and creation of the modern shipping container can be credited to American businessman (and former trucking company owner) Malcolm McLean in 1955. Rather than wait days for ships to be loaded and unloaded he devised a simple system where goods could be packed into standardised, rugged containers - these could then be carried by road or rail but also loaded, locked and stacked securely on board ships for transport across the globe and easily unloaded at the other end. The system revolutionised modern transportation of goods, increasing efficiency, lowering costs but also costing thousands of jobs across ports around the world. Today around 90% of non-bulk cargo is carried via shipping containers. In the UK, enormous ships that can carry over 14,000 containers arrive into ports such as Felixstowe and Harwich or nearby Rotterdam. Containers are then unloaded and moved across the country by road, rail or onto smaller 'feeder' ships that can navigate other ports around the country. To understand more about the process see the BBC Box project at Link which tracked the route of a shipping container across the globe or the excellent programme 'The Box that Changed Britain' - frequently repeated on BBC4 and thus available on the iPlayer at Link . © Copyright Albert Bridge and licensed for reuse under this Creative Commons Licence. This page has been viewed about 44 times.